Manufacturer: Cherry's Industrial Equipment Corp. The Mark TL4 Roller Kit uses steel chain rollers which help move extremely heavy loads across uneven or distressed concrete floors. 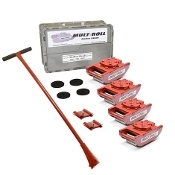 A complete American-Made Kit containing everything you need for all moving jobs up to 80,000 lbs. Each Mark TL4 has a 5" wide frame and 12 rollers providing a more favorable distribution of weight. Each unit has a turning lock (TL) which prevents the Swivel-Top from turning, unless unlatched by the T-BAR TL Handle. The Mark TL4 has a 5" wide frame and 12 rollers providing a more favorable distribution of weight. The roller skid's endless circulating roller chain revolves around a center load bearing plate in the frame, that provides maximum maneuverability in the tightest quarters on ordinary concrete floors. These roller skids are virtually maintenance free, only the roller tracks need periodic cleaning and light oiling. Built to last, designed and Made in America. Warranty 2 Years on the Frame, and 1 year on Component Parts. 90 Days on Bearings and Wheels. Built to last, with superior workmanship and materials. A must have for every shop.